vCenter IP or FQDN. In case of FQDN, the appliance must be able to resolve it! As we distinguish VI stats from VSAN ones (because VI stats are pulled every 5 min and VSAN stats every 1 min), you can choose if you want to query VI, or VSAN, or both by enable/disable it thanks to the Action menu on the right of the vCenter. Note: The credentials are used to create a session that will last as long as possible using a session file to avoid login/logoff events. As soon as you added vCenter information, offline inventory will be generated. Just grab a coffee and wait a few minutes for SexiGraf to retrieve stats, and start Monitoring, like a boss! When you work with several vCenter on your platform, it could be a pain in the … tricky to find virtual machine for daily-basis administration tasks. 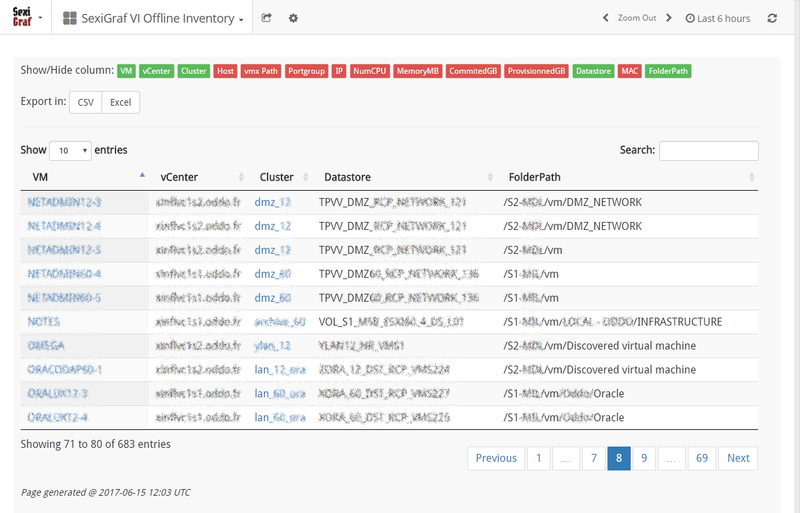 What we used to do during our past job experience is to build some static inventory, to be able to search quickly cross-vCenter some virtual machine information. 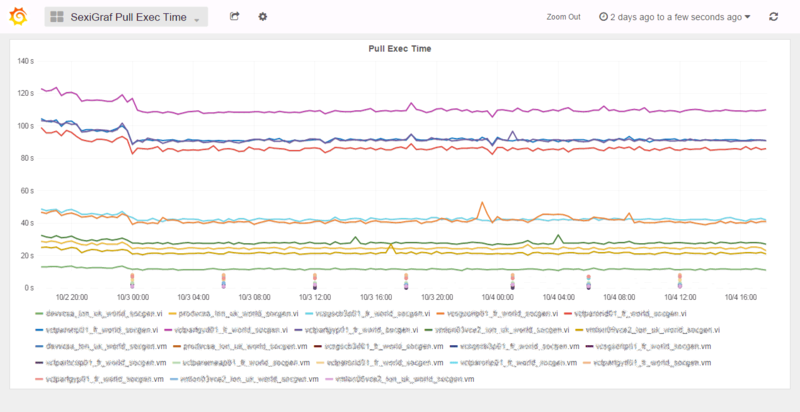 It can be really useful, specially if you have an outage and you want to see on which ESX was your vCenter VM. So we thought about adding this ‘feature’ to SexiGraf as it could be useful to another admin. You could find this offline inventory available on the SexiGraf VI Offline Inventory dashboard. It’s generated every 1 hour (since 0.99e, previously 6 hours) and let you search in any column listed. As we added a lot of info, we wanted to not make too messy, so we hid by default some columns. On the top of the page, you will be able to click on each button that represent a column to dynamically show/hide it. As we plan to add lot of features and content to the SexiGraf appliance, we wanted to make update flawless for you. We didn’t want to say to you “Please update by redeploying a new appliance”. So we built a native updater that’s available in this section. When we will be releasing a new version of SexiGraf, we will provide you a *.sup package (for SexiGraf Update Package) that you will upload to your appliance thanks to this page. After the upload is successfull (it shouldn’t be long as the package will be usually just a few hundred Kb), you will be able to start the upgrade process. After a few confirmation (we’re never too safe), the upgrade process will start, letting you enjoy the up-to-date version of SexiGraf. Without any dataloss obviously. The House Cleaner will let you manage Graphite data (Whisper files) and vCenter session data (Token files). Through this web-ui, you will be able to remove legacy or orphaned stats (i.e. after datastore removal), vCenter session files (for authentication troubleshooting) and oldest Whisper files that may no longer be used. They will be displayed in a nice data tree and will let you select any (one or more) files in order to remove them (don’t be afraid, it will ask you some noisy confirmation before hurting your SexiGraf). As Grafana is based on dynamic query on whisper files, the effect will be immediate, you will not need to restart anything, what you wanted gone is gone for sure! The VI Offline Inventory is automatically updated every 6 hours. If you want to force a refresh, you can use this section to perform a manual update. Just navigate from the SexiGraf Web Admin dashboard to this section and follow the walk-through explanation (basically, you just have to press a one or two buttons, we told you we wanted to make it easy-as-pie!). This section have been added to make debugging easier for everyone. It will provides log detail for several components of SexiGraf (such as VI Offline inventory, or statistics runner, …). You will be able to display on your browser the content of these logs for troubleshooting purpose. It can guide you to identify the source of the issue (bad username/password combination, runtime error, …) and can be useful for us to give you a hand if you need. 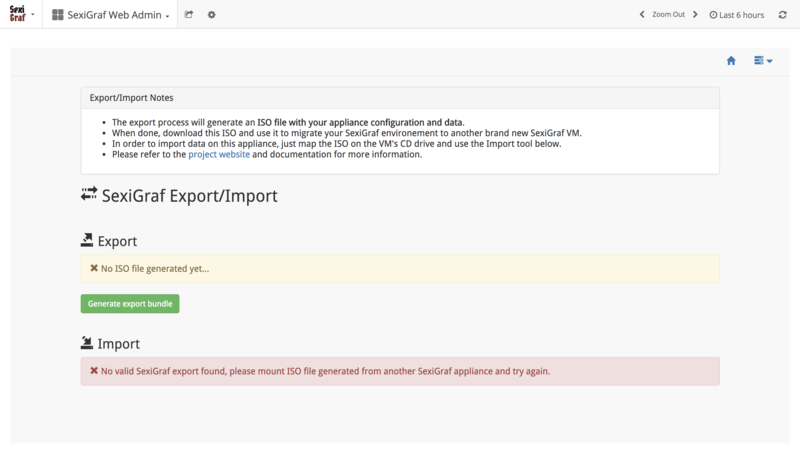 In 0.99e version, we’ve added the Export / Import section to let you migrate your SexiGraf configuration (vCenter credentials) AND data (wisper files) from one appliance to another. The process is fairly simple, you click on Generate export bundle and the appliance creates you an iso file to download (this might take from few seconds to few minutes depending on your environment size). If a dump is already present, Generate export bundle function will overwrite it without prompt. The import only applies to vCenter connections and collected metrics, NO PASSWORD will be changed in the process. Be aware that importing a dump from or to a different version is not supported even if it is supposed to work. Also, be very careful when importing since the process will overwrite anything in its way so it might be a good thing in a migration scenario but also a disaster if you do it on the wrong appliance. Anyway, we always advise you to make a backup or create a snapshot before patching or importing data on your VMs. The export won’t contain any of your custom Grafana dashboards and you’ll need to export/import via json files yourself as documented on the Grafana’s website.